The UN migration pact that was signed earlier this week in Marrakesh was more controversial than it seems. Although it is non-binding, many countries in Europe had serious issues getting a majority of their political parties to back it. Many nations from Eastern Europe refused flatly to sign it at all. Western European countries sometimes added an addendum to make it clear that they had issues with certain protocols. In Belgium, the nationalists of the NVA, the biggest political party of the country, quit the government over their intention to sign the document. Right-wing political movements, joined by soccer hooligans who came to riot against police, organized a ‘March against Marrakesh’ in order to show their discontent over the country’s government signing of the document which could allow more immigrants. The Brussels left-wing mayor forbid them from demonstrating, but the nationalists came to Brussels anyway. After a round of speeches near the Schuman square, where the EU buildings are located, the 'March against Marrakesh' got out of hand. The police forces were attacked and used the water cannon and tear gas. A journalist from national commercial station VTM was attacked with smoke bombs. A few minutes later journalist saw how windows were thrown in with traffic signs and how stones, bottles and fences were thrown at the police. 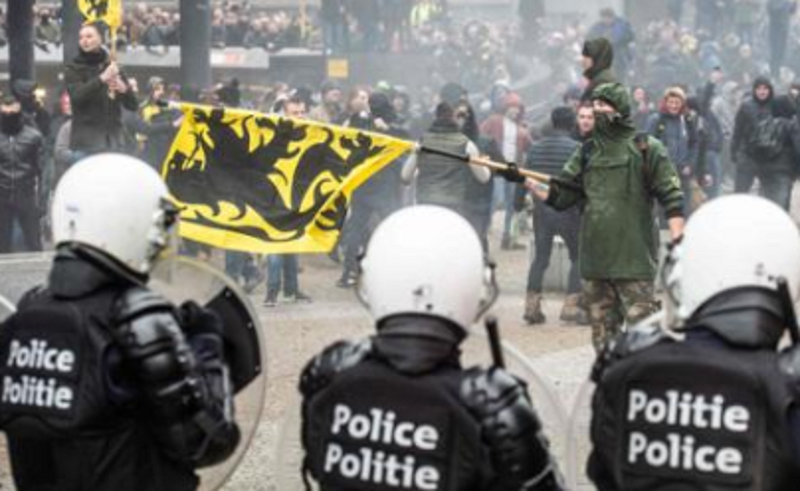 Because the situation escalated, the latter used water cannons and tear gas to disperse the crowd at Berlaymont. Soccer hooligans also arrived at the demonstration. They were dressed in black clothes and wore ski masks to protect them against tear gas and to disallow being recognized. 'Belgium hooligans, Belgium hooligans', they shouted at the Parc du Cinquantenaire, some 200 meters from the Schuman Square. In the end, 90 people were arrested. The protesters called for the resignation of the now minority government of Prime Minister Charles Michel, a closure of European borders and the demand that European governments take care of their own people before taking care of immigrants.